Alonso is a happy and active child. Alonso is part of a sibling group of 3. He is quiet, but gets along well with his peers and siblings. He likes to stay active, enjoys being outdoors, going fishing, riding his bicycle, and enjoys playing sports. He enjoys watching comedy shows. Alonso shows an interest in shoes. 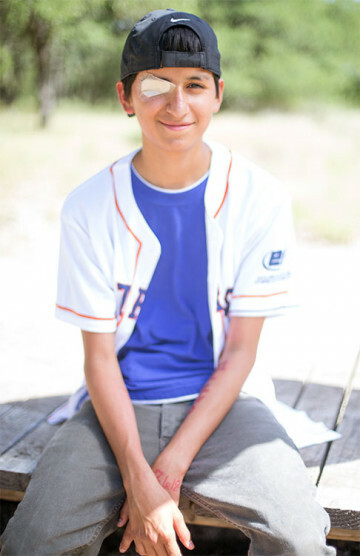 Alonso loves to listen to Tejano and regional Mexican music, and he also enjoys listening to rap and hip-hop. His favorite groups are Los Tigeres del Norte and Los Tucanes de Tijuana, as well as other rappers. Alonso does well with redirection at school and at home, as it helps him achieve certain tasks. Alonso thrives best academically with individual attention at home. His favorite subject is science. Alonso would like to attend the University of Incarnate Word or St. Mary's to study law. Alonso, Jeremiah, and Isaiah are active and fun loving children with charisma and hearts full of hopes and dreams. They consider each other teammates and have a strong sibling bond. They look forward to being with each other and having a family who will support their dreams and passions. Alonso, Jeremiah, and Isaiah love sports, riding their bicycles, and listening to Tejano/regional Mexican music. Alonso and Jeremiah are the oldest and are both protective of each other and their younger brother, Isaiah. Jeremiah and Isaiah are the most outgoing of the three. Jeremiah likes to make jokes and Isaiah is a talkative child. Alonso is the most reserved of the three and takes time to open up to others. Alonso, Jeremiah, and Isaiah are uniquely talented and possess a strong bond with each other. They are looking forward to sharing their love with their forever family. Visit us at the San Antonio Heart Gallery. Alonso is anxiously awaiting his forever home. He will benefit from a family who has a moderately high level of structure, supervision, and support. Alonso will do well with a family who is fully invested in his academic work and is willing to give him one-on-one instruction. He will also benefit from a family that is active and enjoys the outdoors. Alonso needs a family who is willing to become knowledgeable about his medical history and current medical condition dealing with his right eye. He will benefit from a family willing to provide him with unconditional support and guidance, as well as a family who is committed to caring for his medical needs. Alonso has expressed the desire to have a sister and does well with pets in the home. Alonso has made progress over time and needs a family willing to advocate for him while providing new challenges to encourage his progress.